(Nanowerk Spotlight) Cellulose is a biopolymer consisting of long chains of glucose with unique structural properties whose supply is practically inexhaustible. It is found in the cell walls of plants where it serves to provide a supporting framework – a sort of skeleton. Nanocellulose from wood – i.e. wood fibers broken down to the nanoscale – is a promising nanomaterial with potential applications as a substrate for printing electronics, filtration, or biomedicine. Researchers have now reported on a method to control the surface chemistry of nanocellulose. The paper appeared in the April 8, 2014 online edition of the Journal of Biomaterials Applications ("Pretreatment-dependent surface chemistry of wood nanocellulose for pH-sensitive hydrogels"). Using a specific chemical pretreatment as example (carboxymethylation and periodate oxidation), a team from the Paper and Fibre Research Institute (PFI) in Norway demonstrated that they could manufacture nanofibrils with a considerable amount of carboxyl groups and aldehyde groups, which could be applied for functionalizing the material. Using their technique for the production of nanocellulose with tailor-made surface chemistry, the team fabricated hydrogels with pH-responsive characteristics. These nanocellulose gels have a significantly higher swelling degree in neutral and alkaline conditions, compared to an acid environment. This material could be of great interest for critical wound healing applications. "The purpose of this study was to produce nanocellulose from wood with controlled surface chemistry and morphology, which could potentially be exploited to add functionality to the material," Gary Chinga-Carrasco, a senior research scientist at PFI, tells Nanowerk. Chinga-Carrasco also is project manager of the NanoHeal project at PFI, a multi-disciplinary research program with the goal of developing novel material solutions for use in advanced wound healing based on nanofibrillated cellulose structures. The NanoHeal project is funded by the Research Council of Norway through the Nano2021 program. According to Chinga-Carrasco, there are two aspects to consider in this respect. One is on the production of nanocellulose. There are many efforts in Norway and abroad focusing on production of nanocellulose with low-energy consumption. "In our case" says Chinga-Carrasco, " with a modification of the pre-treatment we can produce a tailor-made nanocellulose, with controlled surface chemistry and a specific morphology." The other is on the application Chinga-Carrasco and his team are working extensively in the NanoHeal project with the production of nanocellulose qualities which are suitable for biomedical applications, in this specific case for wound healing. "We have various groups working with assessment of the suitability of nanocellulose as a barrier against wound bacteria and also with the assessment of the cytotoxicity and biocompatibility," he says. "However, as a first step we have intensified our work on the production of nanocellulose that we expect will be adequate for wound dressings, part of these activities are described in this paper." A specific activity that the PFI researchers and collaborators are working with in the NanoHeal project is the production of an ultrapure nanocellulose which is important for biomedical applications. 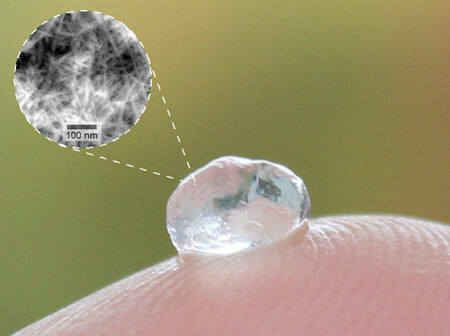 Considering that the nanocellulose hydrogel material can be cross-linked and have a reactive surface chemistry there are various potential applications. "A concrete application that we are working with in this specific case is as dressing for wound healing, another is scaffolds," adds senior research scientist and co-author Kristin Syverud. "Production of an ultrapure nanocellulose quality is an activity that we are intensifying together with our research partners at the Institute of Cancer Research and Molecular Medicine in Trondheim," notes Chinga-Carrasco. "The results look good and we expect to have a concrete protocol for production of ultrapure nanocellulose soon, for an adequate assessment of its biocompatibility." The researchers caution that some points should be taken into consideration when considering nanocellulose materials for biomedical applications. One is the thorough assessment of the biocompatibility with the human body. Another aspect is the interaction between nanocellulose and wound bacteria, which the PFI team is researching with the department of Tissue engineering and restorative dentistry at Cardiff University. "These are aspects not only important from a wound healing application point of view, but also will help in the design of a biodegradable biocomposite material with antimicrobial properties which can have a range of additional potential applications in the future," Chinga-Carrasco concludes.